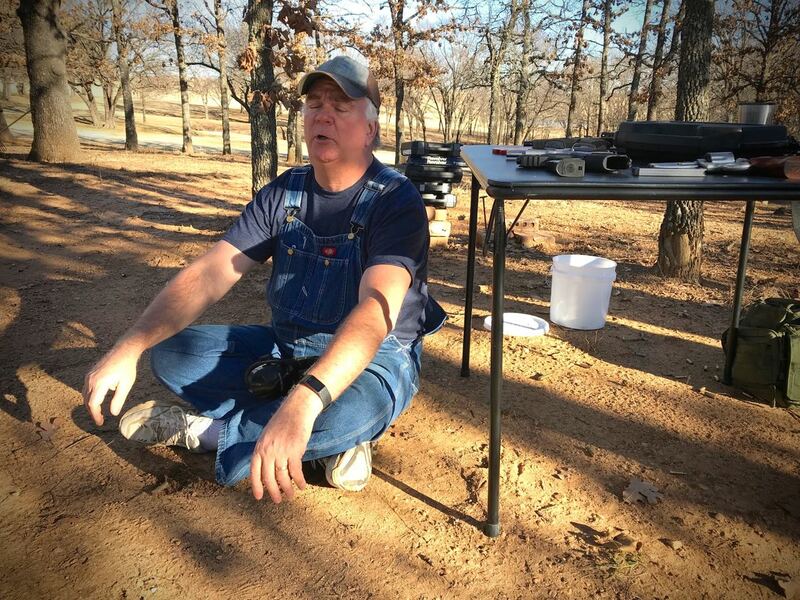 Your humble host prepares to put a .308 round downrange at the home of Wes Edens recently. I recently enjoyed spending a few hours at the country home of long-time friend Wes Edens, a retired police officer and investigator. 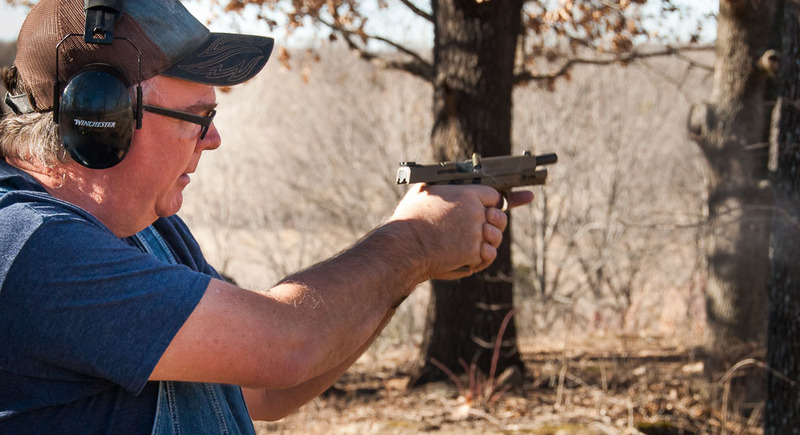 In retirement, Wes has enjoyed his affinity for muscle cars, macro photography, shooting firearms, and handloading ammunition. 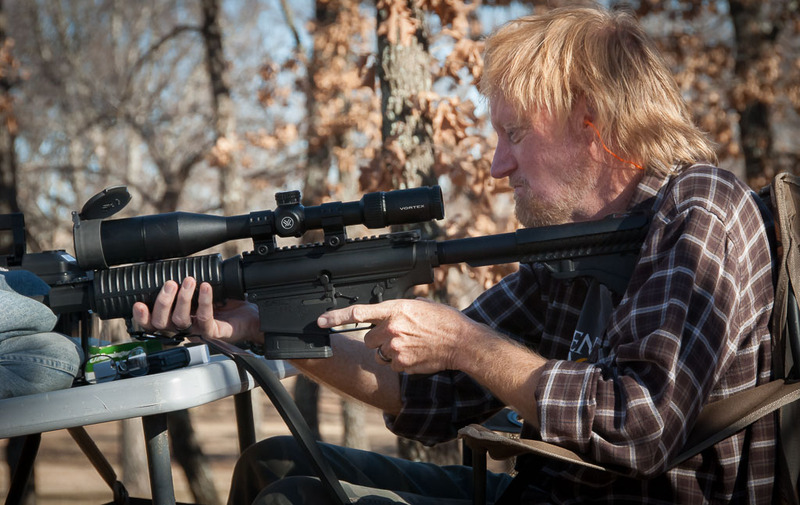 Wes Edens pings a dualing tree with his tan Cerakote .40 Smith and Wesson. On the left is the ubiquitous 5.56mm NATO round. 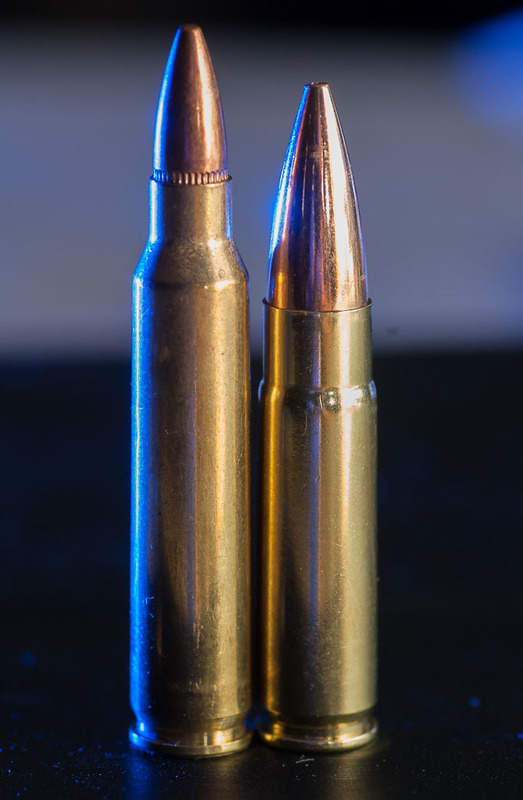 On the right is a popular derivative of the 5.56, the AAC .300 Blackout. I asked Wes if I could come out and shoot when he posted a photo on social media of his new Kimber 1911. I don’t own a .45, but I love the way they shoot, and his Kimber didn’t disappoint: it is a sublime and elegant weapon, smooth, accurate, powerful, comfortable to shoot. 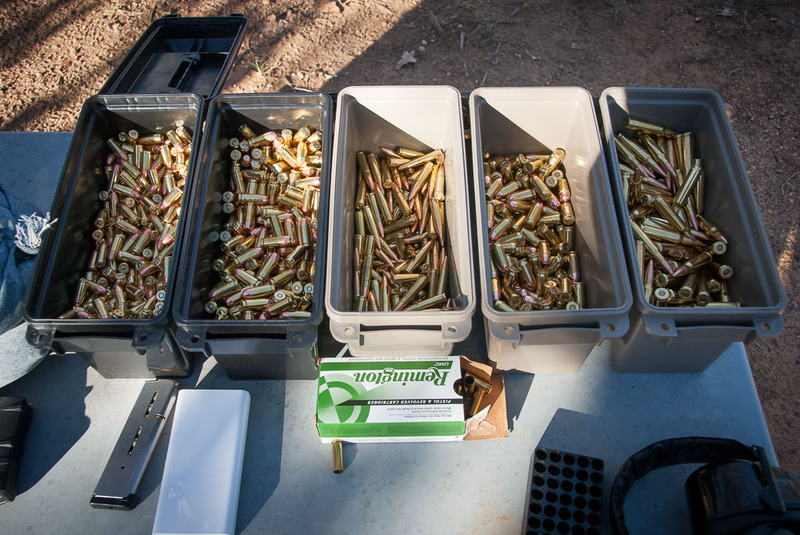 Wes is facing a wild hog crisis, and says he shot more than 50 in the past year or so, mostly with his AR-15 chambered in AAC .300 Blackout, a rifle cartridge derived from the NATO 5.56mm. I’d never shot this caliber before, and found it to be similar to the 5.56mm. Its biggest advantage is that with larger bullet weights, it is very well suited to the use of silencers. Wes also let me shoot a rifle chambered in .308, a full power battle caliber. Both rifles featured expensive, powerful, well-zeroed scopes that made his 100-yard steel target unmissable. In addition to the rifles and the 1911, we shot pistols in 9mm and .40, his original service .357 Smith and Wesson revolver, and my .22LR M&P rifle. Front row, left to right: Smith and Wesson .357, Kimber 1911, Glock 22. Back row: two Smith and Wesson M&P pistols, and Wes’s father’s 1911. All were fun to shoot. Wes hand-loaded all the ammo we shot except the .22 in my rifle. From the left are 9mm, .40, .300 Blackout, .45, and .308. I still don’t care for .40 S&W ammo. For ten years I’ve read about the effectiveness of the round, and about how the recoil is only slightly harder than .45 and slightly softer than 10mm. 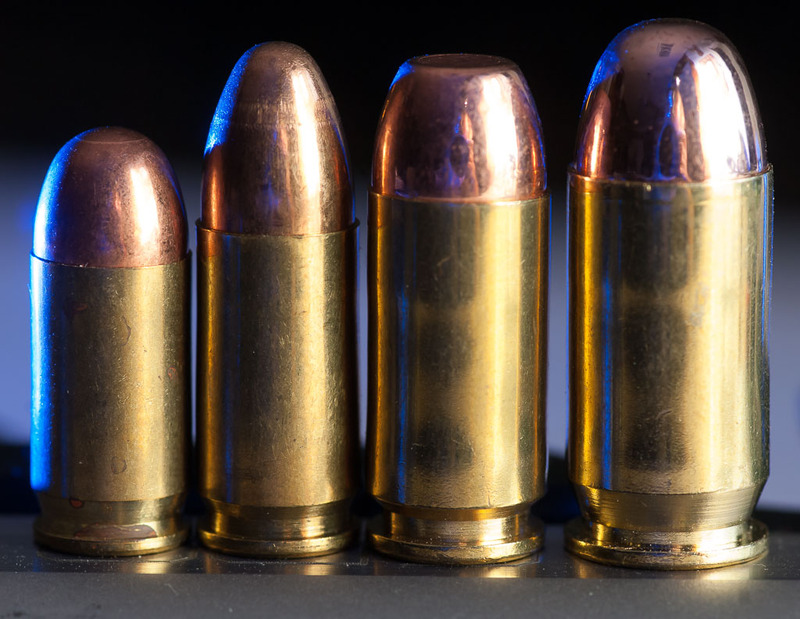 The problem is that .40 is almost always used in polymer framed automatics, which are lighter and yield an unpleasant sharpness, vs .45, which is mostly shot from steel-framed autos, frequently through the 1911, and recoil is a non-issue. Wes made us both a stainless steel tumbler of coffee. We talked all afternoon, and found we both fall in the middle of lot of issues. It was a beautiful day just to be outside. 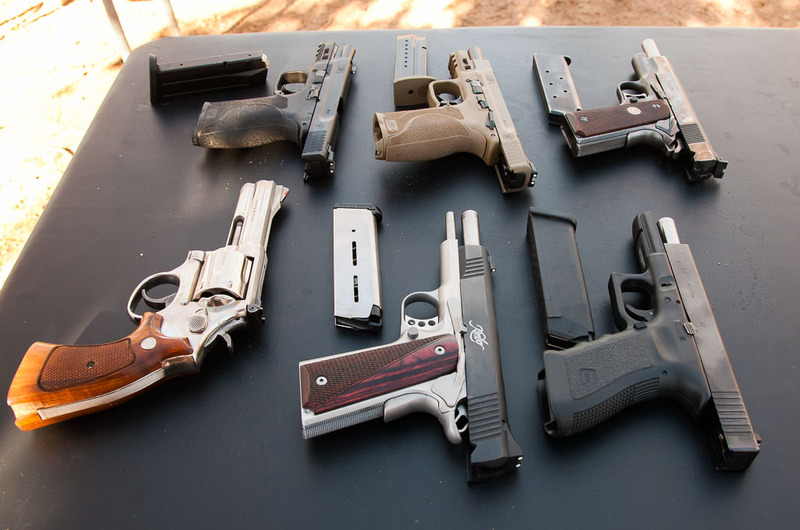 Here are four handgun calibers: .380 ACP, 9mm Parabellum, .40 S&W, and .45 ACP. All are capable and effective, but some are more fun to shoot than others. Wes tagged me on social media today inviting me out to shoot another pistol he has acquired, and I am eager to take him up on the offer; good times in the garden of Edens. Wes Edens appears to be meditating in this image made during a lengthy conversation after we were mostly done shooting. Yeah, gotta love the title.